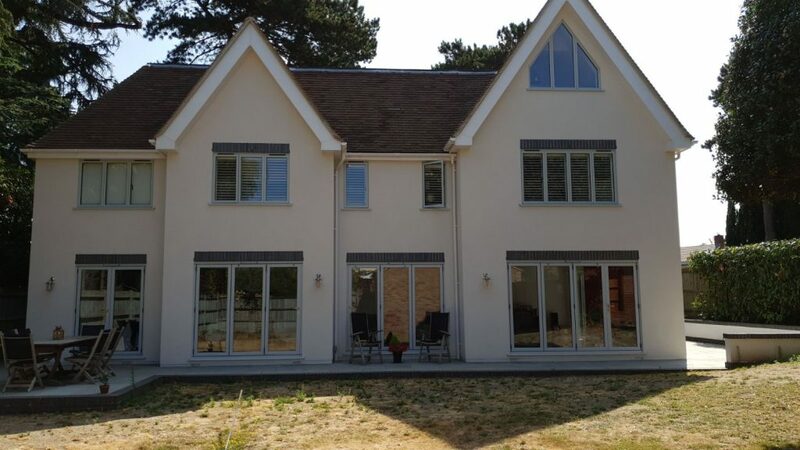 A substantial detached house, improved with the latest Aluk aluminium windows and Origin bifolding doors. This modern house has four sets of Origin doors at the back in a two, three and four panel configuration. The doors are powder coated in a light grey colour. They have black door furniture to the hinges and the intermediate handle is a contrasting brushed satin stainless steel finish. All doors feature traffic doors, ideal for convenient access at times when you do not want to fold all the panels back. The doors have matching colour cills and grey trickle vents. The windows are AluK thermally insulated slimline casement windows in a modern design, featuring large side hung casements. Windows have multi-point locks, locking window handles, matching light grey cills and black trickle vents. A feature gable window also in the AluK system completes the installation. To the front of the property we installed the latest, contemporary aluminium door from Dutemann. If you would like our help in improving your home with the latest generation, coloured aluminium windows, contact us today for a free, no-obligation quotation. Or why not come into our showroom, see our products and talk to our friendly stafff.